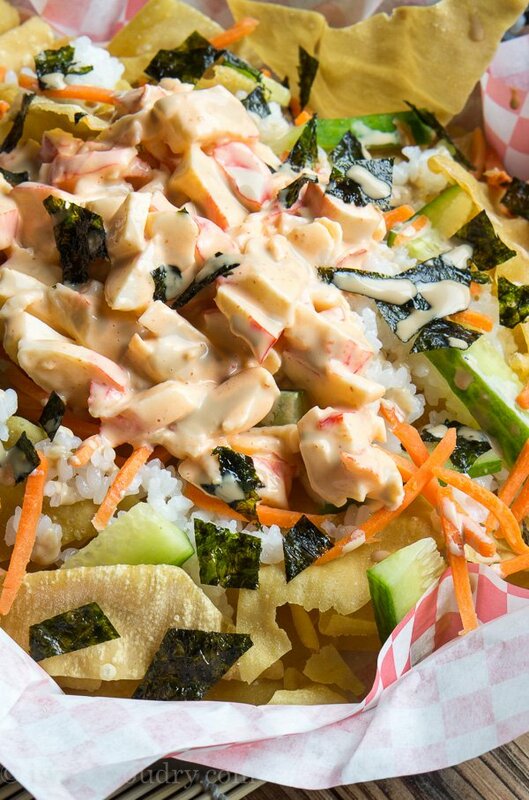 These Spicy California Roll Sushi Nachos are everything you love about a classic California Roll but deconstructed and piled high on a bed of crispy fried won-ton wrappers! Last Friday my two oldest kids came home from school with a pile of papers in their arms and then inform me that it was their last day of school. The teachers have officially gone on full blown strike. Two weeks before summer was supposed to start. I’m not ready for this! I’m not prepared. I feel completely blind-sided. Don’t get me wrong, I love my children and I’m glad their home for the summer, but a Mom needs time to mentally prepare herself for such an occasion. After that shocker I decided I needed to make something even more shocking. 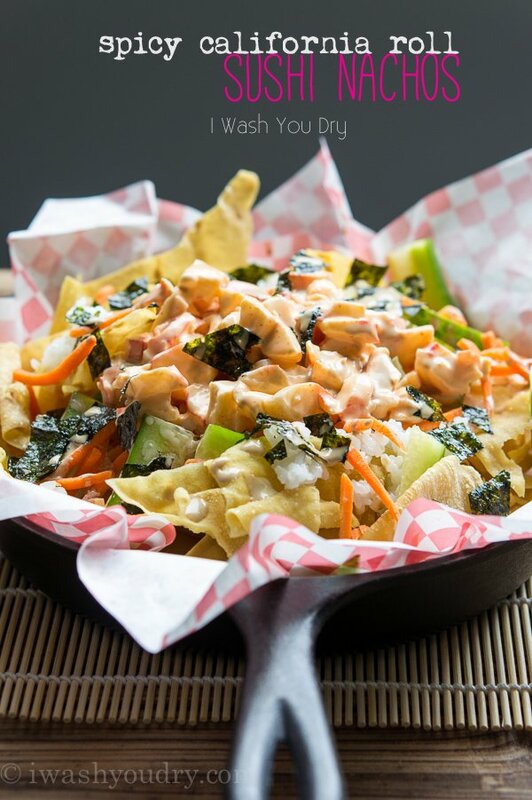 So I created these Spicy California Roll Sushi Nachos. They’re basically the best thing ever. I imagine that if I had a food truck, where I would drive around selling my food, this would be my ultimate dish. 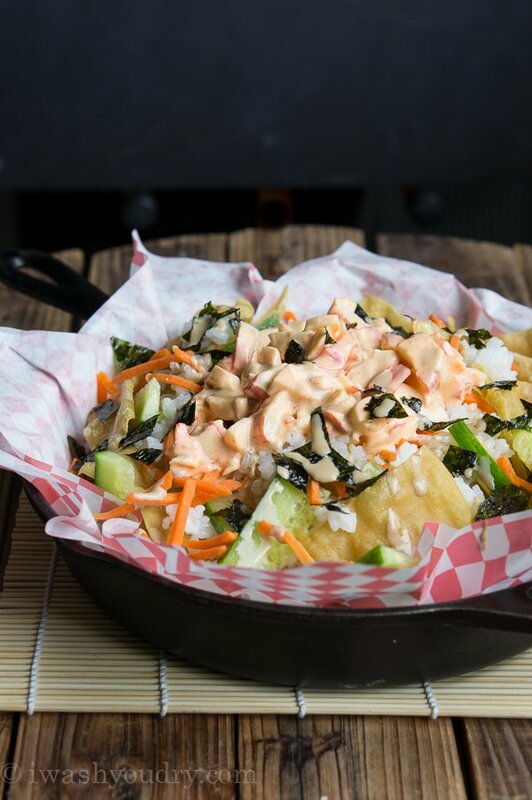 I loved the fun combination of sushi rice on top of crispy won ton chips. 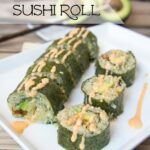 I used my spicy sauce from my Quinoa & Avocado Sushi to toss the crab meat, and then I created an even more fun soy sauce and wasabi aioli to drizzle on the top! I even included essentials like carrots and cucumber sticks, which add a great crunchy texture. I couldn’t forget the seaweed wrapper! I took some roasted seaweed snack sheets and chopped them up and sprinkled them over the top. 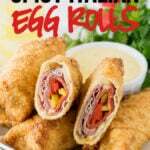 These nachos are a great way to serve some “sushi” to a crowd without having to spend the time to wrap each individual roll. I love creating a fun new spin of traditional dishes. 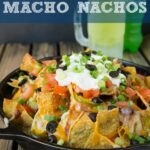 You’re going to love these quirky nachos! 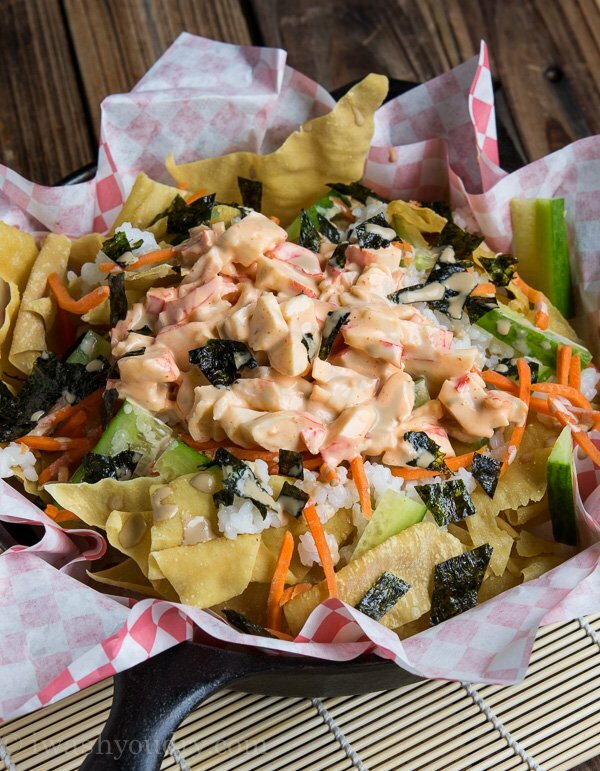 These Spicy California Roll Sushi Nachos are everything you love about a classic California Roll but instead piled high on a bed of crispy won-ton wrappers! Rinse the sushi rice until the water runs clear. Place in a pot with 1 1/2 cups of water and bring to a gentle boil, stirring occasionally. Once it boils, reduce heat to low and cover for 12 to 15 minutes or until liquid is fully absorbed. Meanwhile in a small pot combine the rice vinegar, sugar and salt. Heat and stir until sugar and salt are dissolved, remove from heat and cool. Once rice is cooked place rice in a plastic or wooden bowl, then stir in the vinegar mixture using a wooden or plastic spoon (metal bowls/utensils do not react well with the vinegar). Let cool completely. Cut the won-ton wrappers at the diagonal to for triangles. Fry in batches in at least 1 inch of hot oil, until the crisps turn a golden brown. Let drain on a paper towel lined plate, sprinkle with salt. Combine 1/4 cup mayo, 1 tsp rice vinegar, 1 tsp sugar, 2 tsp sriracha (more if you want it spicier) and a dash of sesame oil in a small bowl. Whisk to combine. Toss in the crab meat and stir to coat. Place the won-ton crisps on a plate, sprinkle about a cup of cooled sushi rice over the top, then add the carrots and cucumbers. Top with the spicy crab meat, then sprinkle with the chopped roasted seaweed. Make the soy sauce drizzle by combining the 2 tbsp mayo with 1 1/2 tsp soy sauce and as much wasabi as you’d like. 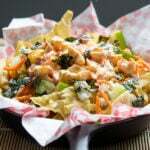 Drizzle on top of the nachos. Serve immediately and enjoy! This is so creative! I love all of the flavors, what a perfect snack! Shawn what are you doing to me? This looks seriously beyond amazing! You are so creative girl! Love it!